Growth Habit: An erect plant which can grow up to 1.5m in height but averages 80cm. It has a stiff, spiny stem and sticky white sap. Type of Plant: Prickly lettuce can be an annual herb or a biennial. Flowers: It has a yellow, daisy-like flower. Fruit/Seed: Seeds are produced in summer. Dispersal: Seed is easily dispersed by wind as they have the typical daisy-family parachute of hairs, which are also found on plants such as dandelions. 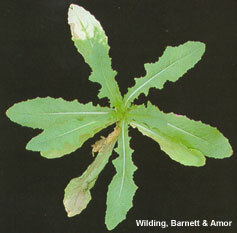 Distribution: This weed may be found in gardens, roadsides, wastelands, cultivated areas and degraded pastures. Grubbing (all year). Ensure entire plant is removed especially the taproot. Herbicide (summer, spring and autumn). Herbicides registered in Tasmania include dicamba, MCPA, glyphosate, 2,4-DB and 2,4-D.